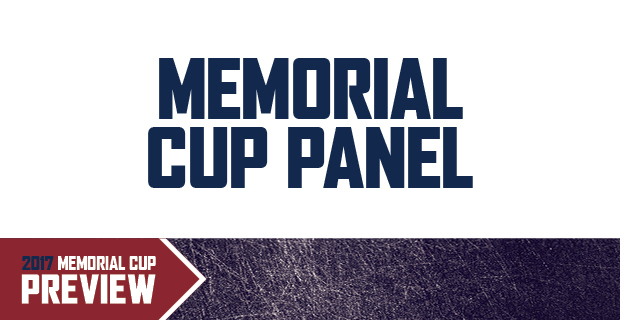 Many expected that the 2017 Memorial Cup would feature 1, 2 and 3 from CHL’s Top Ten. But Seattle defeated the No. 1 Regina Pats to leave us with 2 and 3 in the Otters and Sea Dogs – and to remind us that anything can happen. Here is what our panel is predicting for this year’s event. The underdog Spitfires will either win this thing or finish last. It all depends on whether they can translate a long respite into an advantage. The Sea Dogs are playing tremendous hockey this spring. Thomas Chabot might be the best player in the CHL right now, and the rest of the roster is stacked with 20-year-old NHL prospects. As for the Otters, they have some of the most dangerous scorers in the country, but they seem to lack some of the back-end tenacity of the Sea Dogs. The Thunderbirds left it all on the ice in their series with the Regina Pats and have proven they deserve as spot at the table, but you can’t help but wonder how much they have left in the tank. Finally, the underdog Spitfires will either win this thing or finish last. It all depends on whether they can translate a long respite into an advantage. The Seattle Thunderbirds accomplished the extraordinary last weekend by knocking the Regina Pats off their high horse and into the off-season, and that’s worth some serious consideration entering this year’s Memorial Cup. While the Thunderbirds only held an honourable mention in the CHL’s final Top 10 rankings, they eliminated the longstanding No. 1 Regina Pats, and will come up against No. 2 and 3 in the OHL champion Erie Otters and QMJHL champion Saint John Sea Dogs, respectively. Clutch performers like goaltender Carl Stankowski and forwards Keegan Kolesar, Mathew Barzal and Ryan Gropp will likely continue to be just that after winning the Ed Chynoweth Cup in just 20 games — making the T-Birds my team to beat. As for the host Windsor Spitfires, they’ll be in for a steep challenge after bowing out of the OHL playoffs in the first round at the hands of the London Knights. The Saint John Sea Dogs are bringing the total package to this year’s MasterCard Memorial in Windsor, Ontario. They bring outstanding goaltending from Callum Booth, and a solid Sea Dogs defence corps featuring All-World defenceman Thomas Chabot, the QMJHL Defenceman of the Year and playoff MVP. Up front, Saint John will throw four solid lines at you starring seven NHL draft picks. The Erie Otters are an offensive juggernaut, scoring 95 goals in 22 playoff games. Forwards Alex DeBrincat, Dylan Strome, Anthony Cirelli and Taylor Raddysh combined for a staggering 134 points during the postseason. Will Windsor be able to shake the rust off after being eliminated in the opening round on April 4? Can 17 year-old Thunderbirds G Carl Stankowski continue to withstand the pressure of the CHL playoffs and the Memorial Cup? Thomas Chabot has both World Junior and QMJHL playoff MVP honours under his belt and it wouldn’t be surprising if he adds Memorial Cup MVP to that list. The Sea Dogs defender has been the heart and soul of his team and he’s blossomed into one of the top youngsters in the Ottawa Senators’ prospect pool. Look for Tampa Bay Lightning draftee Mathieu Joseph to be a catalyst on the offensive end while Carolina Hurricanes prospect Callum Booth was sharp through the playoffs as the Sea Dogs went 16-2. The Otters are loaded with star power. Alex DeBrincat, Dylan Strome and company should take them a long way through the Memorial Cup. Seattle’s strong postseason run shows they’re sure to make it a tough tournament and it will be interesting to see what Windsor does coming in with more than six weeks rest after an early playoff exit.